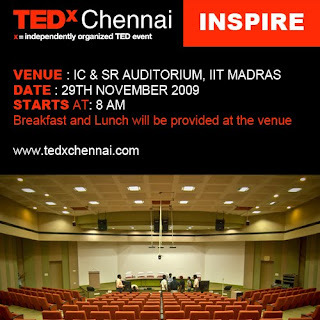 One awesome event to watch out for, this month end, is the TEDxChennai, happening at IIT-Madras on 29th November. Be a part of it and Be Inspired!! To know what TEDxChennai is, you need to know about TED and TEDx. TEDx Chennai has the same passion as TED: Spreading Ideas. The mission is to reach out and inspire people to learn, share and discuss “Ideas Worth Spreading” that have the power and potential to make a difference in our lives, our world and in Chennai. TEDx Chennai has a great lineup of speakers. Be a part of it and Be Inspired!! Ticket sales closes by Thursday (26 Nov). Book the tickets!